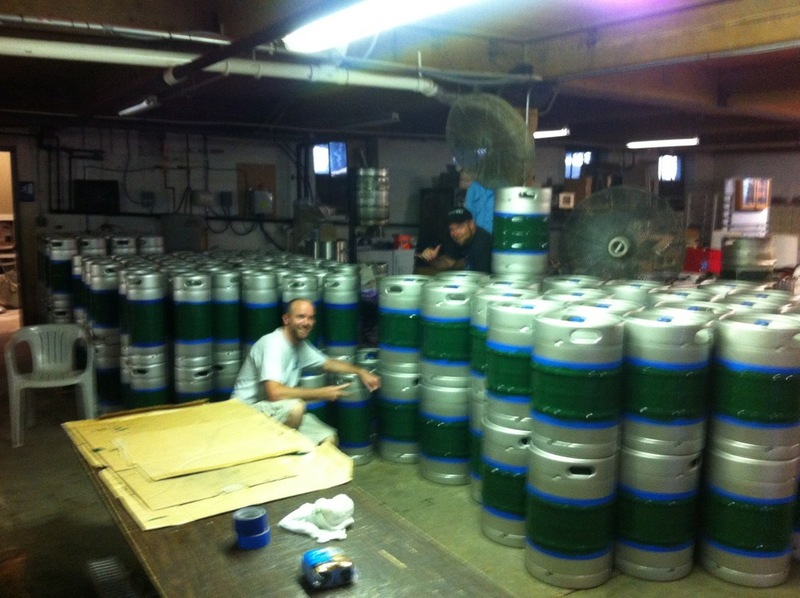 Hey Roy Pitz fans and friends we wanted to give you another update on the operations at the brewery. We are continuing to spread LIQUID ART into new areas and to keep up with demand we have purchased some beautiful new stainless steel kegs. Here's our finished product on the left but check out how we tag them and get them out to YOU! We are happy to announce that it's almost pumpkin time. AND while that is an exciting announcement we also don't want summer to be over yet. So as promised in a previous brewers blog we are almost ready to serve our Chambersburg Peach Lager as well. Thanks to Hauser Winery for pressing local Chambersburg peaches for us in their apple press. This amazing juice infuses the beer and gives a cider aroma and a sweet peachy undertone in our refreshing light German lager. Come enjoy it before it starts getting cold outside! Chris bringing in the fresh peach juice. Roy with a special blend of cinnamon, clove, nutmeg and ginger. He's about to throw it into the kettle to boil it. This makes the entire brewery smell AMAZING. That pumpkin is TOUGH to shovel out. See the orange spots? Click me if you don't and I'll get bigger. Ichabod Crane's Midnight Ride will be available very soon as well. This is our Belgian Style Pumpkin Ale that has a balance of ingredients including malted barley, clove, nutmeg, cinnamon, ginger, REAL pumpkin, caramelized brown sugar and a spicy phenolic yeast. We are excited to bring back this fan favorite. We will see you at the Stube.